In action: Maasai Cricket Warriors. Photo courtesy: Maasai cricket warriors. Imagine a cricketer who is a semi-nomad cowherd living among the wild animals of Africa. Imagine him who wears layers of beads; who sets fire on the field with his bright red clothes and flying braided hair; he who gives war cries while throwing or hitting a ball and is actually a crusader for peace. 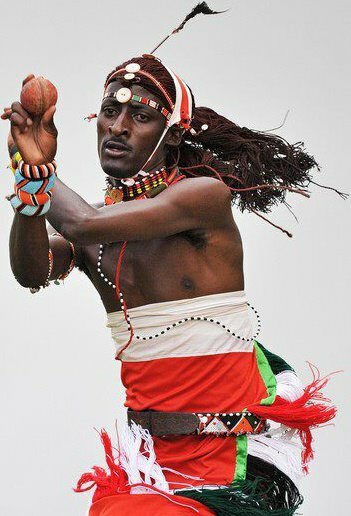 Imagine him - a Masai tribesman - playing a T-20 league. Unbelievable? 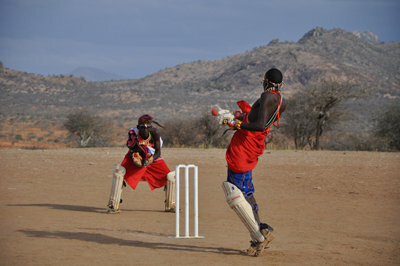 Then you ought to meet the Maasai Cricket Warriors (in photos). The Maasai warrior cricket team, to quote an old Pepsi tag line, has nothing official about it.And that's where the beauty lies! The team consists of 11 men (plus another 10 in the reserve) - each one intending to be a role model in his community. And his strategy to be famous? Not by earning lots of money or through links up with supermodels or picking up fights at nigh clubs, but by campaigning against traditional female circumcision (FGM), child marriages, and HIV/AIDS among tribal youth. The team, originally from a village in the Laikipia region of Kenya was founded in May 2007 (and how interesting it is that the founder is a woman who is also the team's coach and mentor?) Though fairly new, the team is quite clear of what it wants and is also quite suave with their communication. For example, they have a great website, a Facebook page and they are very responsive when approached. They have played a few matches with a visiting team from neighboring Tanzania and is now all ready to go further, by playing global tournaments outside Kenya. So, come 27th March and the warriors will be in Cape Town, South Africa, taking part in the Last Man Stands World Championships - a T-20 event that will go on till 7th April. Dressed in their signature colorful garbs, instead of the traditional cricket whites, the warriors will add zing and bling to the game when they take to the ground, armed with a wooden bat, instead of their spears. Watch out for that event. And yes, the warriors are now open to travel anywhere - and they mean ANYWHERE - in the world as long as it helps them spread the words against the triple evil of HIV, FGM and Child marriage. Interested? Then why don't you join the group on Facebook and gift yourself with a brand new set of heroes, instead of those old, greasy-palmed, oh-so-boring ones? Child marriage is rampant in Kenya. UNFPA record shows, 42% girls are married before they turn 18 in Africa. Nice Blog updation. I saw few post in your blog is really excellent.